My tomato plants have been growing very well and I am happy with their progress. As I mentioned in my last post, I have been staking them up by using some sticks from trees which have fallen in and around my property. They make excellent stakes and don’t cost anything but for a little effort in sharpening one end with the machete I made last year (for my 13 skills). When I planted my tomato seeds I usually plant three seeds in the same area, with the hope that one of them will work. As the seeds I have used are so good I have found that most of the seeds have sprouted and I now have too many in the same areas. Normally, I would take a pair of scissors and cut the seedling I don’t want (so in this case, I would cut two of the three). The roots and cut stalk would provide nutrients for the remaining seedling. Lately, I have changed this, so that I am using the superfluous seedlings in another way. 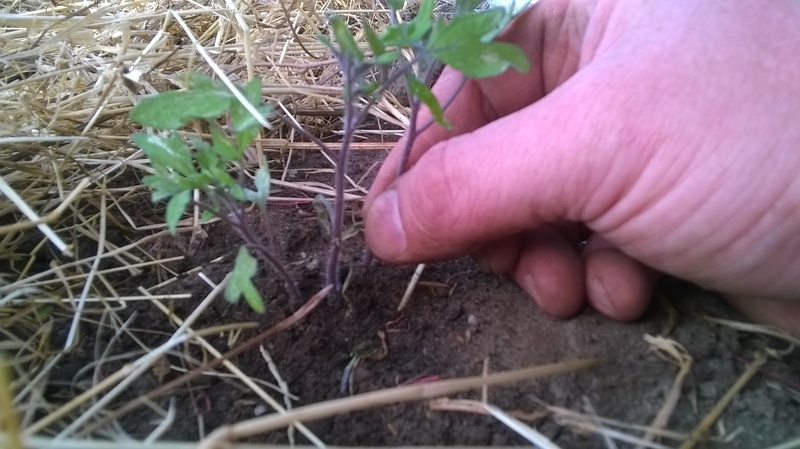 As my soil is very friable I am able to gently remove the additional seedlings with a gentle tug and replant them in a nearby position. Nearly every one of the plants that I have moved in this way has taken to their new position, so I have improved my tomato harvest with such a simple change. I am always careful that when I do this I intend to do little or no damage to the roots of the seedling remaining in the position. I know that I am doing a minor amount of damage, yet I choose to believe that it is very little, compared with the potential increase in production. You can see the images that follow the process. 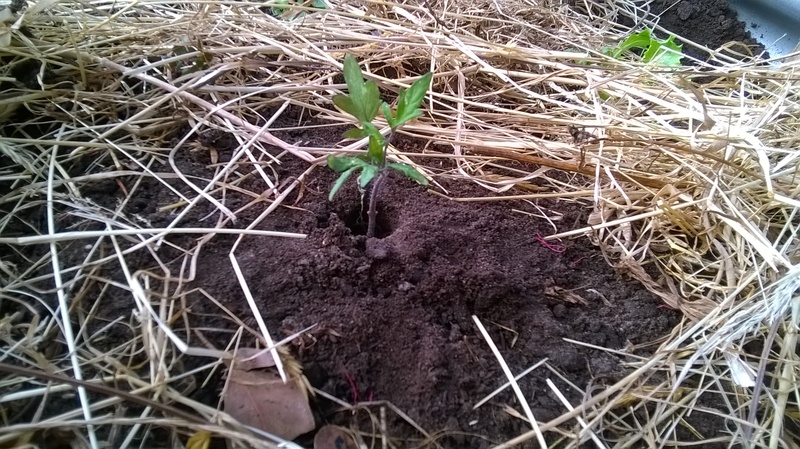 I have located a stand of three tomato seedlings. I select the two to be removed and I gently (yet firmly) grasp the stalk. I slowly begin to move it upwards, being prepared to stop all movement should the “good” tomato show any signs of impact from this removal (such as the ground around the goods seedling rising with the one I am removing… or the good tomato seedling shaking, showing signs of movement). Once removed, I examine the root structure. I hope to find a nice ball of roots, with strands in different directions. I also hope that I have kept a little soil to keep the structure intact. I poke a hole into the area I wish to plant the seedling. I use my finger for this, yet you could use a dibble if you were so inclined. 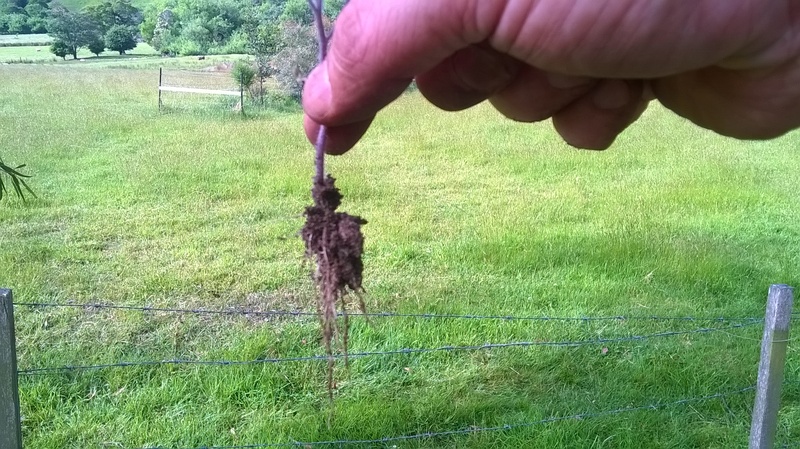 I try to ensure that the roots are placed neatly into the hole, and I then gently push the soil back into place around this root hole, so that the roots are covered, yet not stressed or damaged. Water the newly moved plant. my arm guard for archery. My fabric and pattern for my cargo style pants. Now that I have the arm guard I will be able to start teaching my children about archery, which was another of my 13 skills for this year. I hope to start that as soon as the weather is more pleasant. I also will start learning to sew, with the intention of making a pair of gardening pants (lots of pockets for tools and items… maybe some padding on the knees for when I have to get close to the ground for garden work).